Daniel Ricciardo admitted he was lucky to come home third in Sunday's Berlgian Grand Prix. The Red Bull Racing man capitalised on the misfortunes of others to take the final spot on the podium at Spa-Francorchamps, the scene of his second victory in 2014. 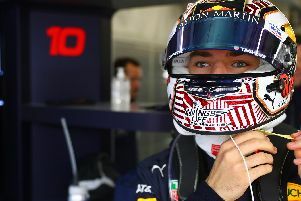 But that's not to say the podium place fell into his lap - Ricciardo completed a bold and brilliant move on Mercedes' Valtteri Bottas, over taking on the left, while Ferrari's Kimi Raikkonen overtook on the right to make it three wide down the Kemmel Straight. Ricciardo would brave it out around the outside while Raikkonen would hold the inside, sending Bottas from third to fifth. “It’s always nice to get a podium for sure," said Riccirdo, who started the race sixth. "Especially after yesterday when you’re on the tail-end of that top sixth, then all you think of is moving forward, so I honestly believed we could be better than sixth today. "Max had a problem and then Kimi made his mistake with the yellow flag so we gained a few positions but I think after the first stint our pace improved a lot. We showed a more respectable pace today and then we had an opportunity under the safety car with the re-start and took the most of that, so I’m really happy with the result."